Clouds are not just beautiful creations in the sky. They are visible manifestations of weather patterns and take part in atmospheric activities. Take for example altostratus clouds. What does this cloud type indicate? What weather condition does it bring? Read on to learn more. Altostratus is the type of cloud you see on a cloudy day. Some people call this the boring cloud that often spreads out thousands of square miles. It is closely associated with upcoming light rain or snow. Although they are not capable of yielding heavy rainfall, altostratus clouds can progress into nimbostratus clouds which are responsible for heavy rainfall due to sufficient amount of moisture stored therein. At What Height are Altostratus clouds found? This type of cloud belongs to the middle level cloud group. Clouds in this group are found 6,000 to 20,000 feet or 2,000 – 7,000 meters above the Earth’s surface. Altostratus cloud is a sign that there is huge amount of moisture in the atmosphere. The sun may still shine through these clouds but looks fuzzy or watery. Altostratus clouds are potentially dangerous for aircrafts as it can initiate ice buildup on the aircraft’s wings thus altering its aerodynamics. 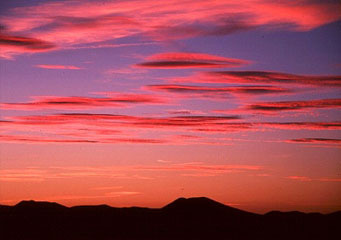 Altostratus cloud is further categorized into species and varieties. Here they are. Altostratus in this category is characterized by thin layers of wave-like formation. Although it does not produce significant weather condition, altostratus undulatus signifies slight mid-atmospheric instability due to wind shear. In this cloud formation, you will see two or more layers of altostratus clouds on top of each other. Altostratus pannus comes with several cloud shreds resulting to more profound chaotic layers. The contour of the sun is visible through this grey-blue cloud. Altostratus Translucidus usually develops when warm air is lifted upwards due to the advancing warm frontal system. In this altostratus species, the clouds appear in arranged and wide parallel bands pointing towards the horizon. Altostratus in this category appears like hanging pouches, resembling a woman’s mammary glands, underneath the clouds. Altostratus opacus is the gloomy cloud variety usually seen in wet days. When altostratus opacus matures, it descends as nimbostratus and rain will start to fall. Altostratus clouds develop due to the rise of large air masses followed by condensation caused by an advancing frontal system. The upcoming frontal system brings about far-reaching decks of clouds that may spread more than thousands of square miles. In addition, altostratus type of cloud may likewise develop from other cloud types such as cirrostratus, altocumulus, nimbostratus and cumulonimbus. Altostratus clouds are characterized by their uniform gray cloud layer ranging from thin clouds that let you see the sun, to thick layers of clouds that completely block the sun. With regards to color, altostratus clouds are darker compared to cirrostratus but lighter than nimbostratus. Other than that, these clouds are smooth and featureless. How common are Altostratus clouds? These clouds are commonly seen when there is an advancing warm frontal system and precede the nimbostratus clouds. They also develop on or after severe thunderstorm outflow. Whenever you see altostratus clouds in the sky, it’s a warning sign that light rain or snow showers is about to set off due to a frontal weather system.